Jigs certainly aren't as glitzy as crank-baits, or as sophisticated as sonar/GPS technology, but of all the tools available to walleye fisherman today, the lowly lead-head is responsible for more angler success than anything you can name. And though millions of anglers have caught millions of walleye on jigs and jig-heads, the lure generally remains underused in terms of technique and location by most recreational walleye fisherman. If you want to set up your jigging program, check out the following advice courtesy of some of the hottest walleye anglers on the planet. It's sure to help you catch more walleye (not to mention pike and muskie) this year, and in ways/locations you probably haven't considered. Rocky reefs, gravel points and mud flats are classic walleye haunts, but they're far from the only game in town. 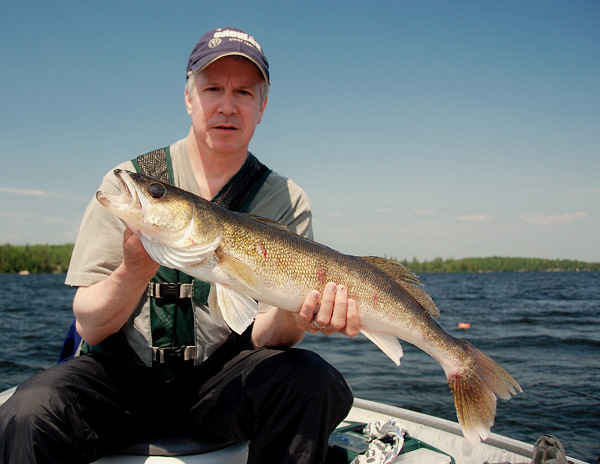 Many anglers know walleye occasionally look to weedbeds for food and shelter. Some probably even recognize that in many lakes, walleyes actually live in the weeds full time. But knowing they're there and getting them out can be two entirely different things. Weedbeds aren't exactly angler friendly. In fact, the frustratingly high percentage of time fisherman often spend dealing with snagged lures probably keeps a lot of them from ever venturing into the jungle. Professional angler and former fishing guide Scott Glorvingen isn't among that group. On the contrary, he spends a lot of walleye time in the weeds during spring and summer. He's honed his methods to a keen edge, and encourages other fishermen to break away from the reefs and fish the weeds more often. "Jigs are a great option for fishing weeds," he says, "and prime time to jig the jungle is when the plants are maturing and first hit the surface. Typically, this happens in the first part of June. Walleyes of all sizes can be shallower than most angler think at that time, and they're feeding aggressively." He didn't always think this way; in fact, he'd been a reef-runner and flats-forager in the early years, just like most walleye fishermen, but began finding walleyes in the weeds and finally made the connection. "I'd be in the weeds, probably trying to save a busted guide trip by catching some pike or bass," he laughs, "when the client would accidentally hook a walleye. "It was like,'now where'd that fish come from?' Finally I realized the walleyes were living in the weeds and were probably doing the same thing in all the other lakes I fished". Now, years later and a lot smarter, Glorvigen has a plan for weed walleyes that begins with locating prime lies - the best cabbage weeds, coontail or bulrush beds adjacent to deep water. "You'll rarely find walleyes back in the shallows, far from the depths," he says, "so my first contact is always where the weed line is closest to deep water." With the boat positioned perpendicular to the edge, and bow pointed into the weeds, Glorvigen starts fishing the outside of the weed line then works his way farther back. "It's the best way to get back there without spooking the fish. If I'm fishing with a partner, I have them stand on the bow with me." He looks for channels, slots and pockets and keeps casts short- no more than 40 feet- which keeps the line angle more vertical and helps minimize snags. "Let the jig fall to the bottom and make a slow retrieve," he says. "The biggest mistake fishermen make in this situation is to fish too fast. Picture walleye moving through the thick weeds; it can't see very far, so it's stalking by sound and vibration. If you just hop the jig across the bottom, you'll pull it out of the strike zone and a walleye won't be able to accurately locate the source of noise." Glorvigen describes his presentation as a slow drag; "about six inches at a time." He'll shake the jig as it moves along so it might hop about a half-inch, but that' s it. Then, he'll pause the retrieve for anywhere from fives seconds in open areas with sparse weeds to 20 seconds in fairly dense vegetation. "The thicker the weeds, the longer the pause," he says. To keep the vibrations going, he might periodically shake the jig during the pause. The idea is not to move the lure forward; just to create some noise to give the fish a target. Bite detection requires extreme concentration in this situation. "A weed walleye won't 'swim through' the strike or turn and swim off with the bait," he says, "It will just ease up and inhale the jig." A tightening of the line is often the only clue, so you have to watch the line. Glorvigen uses 10- or 14- pound FireLine in crystal in more open areas, or Flame green in thicker weeds. He ties on a 1- foot mono leader in matching test weight on the end, attached with a small barrel swivel. "I want a sensitive, visible line, so I can see it jump or tighten on the subtle strikes, then make a sweeping hook-set that pulls th fish up and out. I'm not worried that a walleye will see the line. The bottom is so cluttered, the line just blends in with the overall background color and the angles of the stalks and stems of the individual plants." The rest of Glorvigen's weedbed arsenal includes a 6 and a half foot, medium-fast graphite spinning rod with a fast tip and plenty of back bone, and a quarter ounce Northland Weed weasel tipped with a 2-or 3- inch Gulp! Minnow - typically in shad/chartreuse. Getting hung is an inevitable fact of trolling weedbeds, but Glorvigen's jig put the odds in his favour. It has a pointed nose, with the line tie at the very front as well as weed guard to protect the hook. Together these characteristics allow the lure to slip through the plants - for the most part, anyway.
" You have to face the fact that you'll get snagged up sometimes. That's just the way it is. The pointed jig head and somewhat vertical presentation, but it's going to happen no matter what. That's the reason for the stout rod and tough line; most times they allow you to pull free without much trouble." Flooded timber, brush piles and fallen trees are places many tend to avoid, because of the potential problems they pose. Walleyes, however, gravitate to these nasty spots at times. Pro angler Mark Courts is one who refuses to bypass these walleye gold mines. Rather than casting and reeling, though, he uses a jig-and-float to get into the strike zone and snake big fish out of the timber. 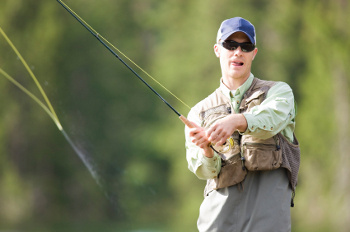 The key to locating fish, he says, is to isolate spots within the large expanses of standing timber - areas that tends to concentrate the walleyes. Sometimes you need sonar to find it; sometimes you can see it with your own eyes, but what you are looking for is something that forces fish into an area - it could be a rock pile or brush on the bottom. It could be a treetop that's broken off, or even a change in the bottom itself - like a drop off or ridge. "I use a jig instead of a plain hook, because it stays closer to the bottom." You don't need a lot of weight. most times he fishes a 1/8- or a 1/16- ounce ball head under the float. Sometimes even down to a 1/32- ounce head. Whatever the case, Courts uses a 6 1/2- foot medium to medium-heavy power spinning rod laced with 10- to 14- pound FireLine and a fluorocarbon leader. "When I pinpoint a likely spot, I anchor or tie off to another tree, then cast upwind and let the rig drift through or over top of the cover." He pins a leech or rigs a 'crawler' on the hook, allowing wave action to lift and drop the float, and give more action to the bait. In big lake walleye factories like Wabigoon Lake, trolling is king. Anglers are meticulous about their spreads and sets, and focus their efforts on finding fish in open water. Jig presentations, however, should be in every walleye angler's mindset, particularly when walleyes are on reefs and flats from pre- through post spawn and beyond. "A lot of the hog walleye will use offshore reefs as staging areas before they run up a tributary to spawn. The critical thing to remember is that most of them will spawn right on that reef. What's more, walleye tend to hang out after spawning, fish that spawn in the river tend to get in and get out, especially if the water level drops even a fraction, it's a survival instinct." For fish that spawn on the reefs, the evacuation instinct is less urgent. They'll come and go and generally stay longer." Glorvigen uses his bow-mount to ease into a fishing area - typically a reef or flat in six to 10 feet of water that's situated between deeper water and a tributary, or windswept or current washed shoreline where the fish will spawn. "I make long casts with a 1/8- to 1/4 ounce jig, then drag and pop it along bottom," he says. "Long casts are essential to not spooking walleyes, while the drag-pop presentation draws reaction strikes from fish that aren't in a feeding mode. Let the Jig fall to bottom, then reel up the slack as you lower the rod tip towards the surface," he says. "Move the jig by raising the rod from 9 to 12 o'clock position; then reel back down to 9 while lowering the rod tip, keeping the line tight so you can feel a hit. Alternate slow drags with sharp snapping pops". That presentation accounts for large numbers of fish, but when it doesn't have to it changes the action if what you're doing isn't working." A 7 foot spinning rod facilitates casting. Glorvigen opts for a medium-light graphite stick with a fast tip (important with smaller jgs) and a beefy backbone a key to making solid hooks with a lot of line out. He uses a 6-pound super line main line with an 8- to 12- inch, 6-pound mono leader. "The mono keeps the jig from rolling up the line when you snap the rod tip- combo with super lines," he notes. Jigs tipped with 3- to 4- inch soft bait grub or minnow bodies are perfect for this presentation, but Glorvigen's pet baits are Gulp! minnow Grubs. Longtime NAFC ally Tommy Skarlis mentions another situation when jigs shine. "Fascinating shorelines is a fabulous technique for increasing your catch for reservoir walleyes in spring, fall and whenever wind and waves create favorable feeding conditions." he says.he starts with a crankbait as a search lure, casting tight to the bank and covering water. Once he finds fish, he slows down and probes systematically with a jig, looking for numbers of walleye. "This lets me hit fish that wouldn't hit a faster moving crank," Skarlis explains. Not all reservoir shorelines are created equal. Skarlis focuses on channel swings - areas where a bend in the main channel or a feeder creek swings in towards shore. Flats on either side of the bend can be productive, but in general, fishing is best where the channel swings closest to shore line. "In other words, if you're in range of the bank and the water isn't at least belt high, the bottom tapers too slowly to contain many fish," he says. In search mode, Skarlis uses the trolling motor to keep his boat parallel while firing a shad bodied every three to six feet along the bank. "Once you catch a walleye or two in a given area, slow down and work it more thoroughly with a jig." Both presentations call for a 7-foot, medium-light spinning rod with fast action. Most of the time Skarlis with high-vis 8-pound super line that he can see easily. When the water is clear he tones down to something more subdued that won't spook the fish. "I use 1/8-ounce Techni-Glo Max Gap jig tipped with a 4 inch Realistix Power Minnow or Gulp! Minnow," he says. "In clear water, a natural pattern like smelt works best. If the water is dirty and visibility is low, go with chartreuse or firetiger." Jig fishing is what you make of it; it can be as simple as banging a rock pile, or as intricate and measured as the techniques you just read about. Take the time to master these skills, and you'll be rewarded with many more walleyes in your net this year. Who knows - you may even catch a blue Walleye.